The world has gone wireless. The mobile phone network now stretches across most of the entire globe, but for travellers frequently roaming between regions, using a cell phone abroad can be very expensive. Cue Goodspeed, a multi-SIM device about the same size as a smartphone that can get you onto the Internet anywhere on – pre-paid and from any device with Wi-Fi. Since every smartphone has a SIM card built-in by its very nature, it is technically possible to get online anywhere in the world with a device like the Goodspeed, but only for a very high price. The Goodspeed changes all of that by providing, for a fixed, prepaid price, a data plan, though it also means you can get a tablet or a laptop online as well as a phone. Physically, the gloss black and shiny Goodspeed device is easy to travel with. At128g it’s much lighter than a phone, and its 120x63x11mm size means it can sit in a jacket pocket or day bag without any problems. It charges-up over microUSB, and has a standby switch on the rubberised, non-slip rear. When turned-on, a tiny screen on the front informs you that it’s looking for a local 3G network. When it finds one, it gets online; simply hit the button on the side of the device to reveal a password. Identify the Goodspeed as a WiFi network on a phone, then login and start surfing. Easy. In our tests the speed of the web connection was impressively fast and dependable, though that will depend on which 3G network it taps into. 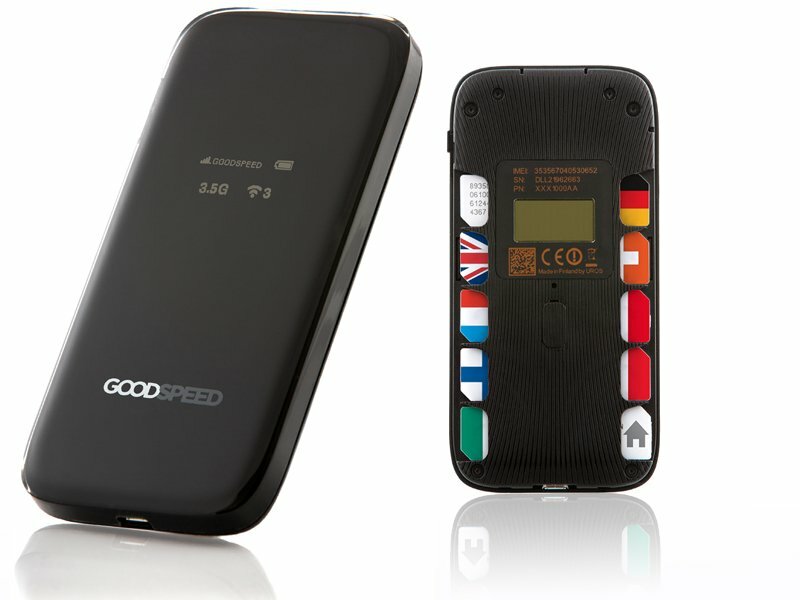 Goodpseed boasts comprehensive service coverage in 60 countries across the globe, including major European countries, USA, Latin America, Canada, Russia, Asia, Australia and China and the device can accommodate up to nine SIM cards. Goodspeed charges a daily flat rate of €5.90/€9.90 for between 500MB and 1GB of data when roaming abroad (the average internet users consumes 250MB a day). Compare that to UK mobile operators that charge between £3-£8 per MB of data outside of the EU. However, it works in the UK and Europe, too. The best thing about the Goodspeed isn’t the low all in one price for data roaming outside of the EU, but the fact that its pricing plans are so easy to understand. In a market that has lacked any kind of transparency until now, it’s a great approach that should win Goodspeed a lot of fans among those of us who frequently venture outside the confines of Europe.